Analysis shows that some communities are not benefitting equally from the state’s top-ranked energy efficiency programs. Year after year, Massachusetts is recognized nationally for its efficiency efforts. Yet, our utility-administered programs consistently fail to capture all cost-effective energy savings, despite being required to do so by state law. In addition, barriers to accessing energy efficiency savings persist for low-and moderate-income residential customers, renters, and households for whom English is not a primary language. The result is that some communities are under-served by programs that we all support. A new report by the Applied Economics Clinic (AEC), commissioned by the Conservation Law Foundation in collaboration with the Green Justice Coalition (GJC), puts into sharp relief the extent to which the Commonwealth’s award winning programs are not reaching the Bay Staters who stand to benefit the most from the energy and financial savings that come from efficiency programs. 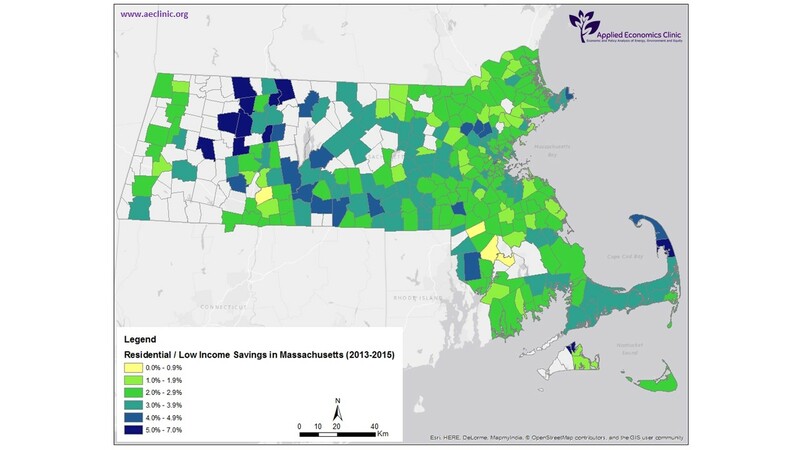 How do savings from efficiency in your community compare to other places in Massachusetts? Energy Efficiency: Who benefits from energy-saving programs in Massachusetts? Energy efficiency is our cheapest, cleanest, and most abundant energy resource. It helps consumers save money, reduces the need for new energy infrastructure, and benefits public health and the environment by reducing emissions. Massachusetts law requires regulated natural gas and electric companies to exhaust all energy efficiency options that are “cost-effective or less expensive than new supply.” In other words, utilities must first look to efficiency so long as it is the cheaper option as compared to electricity and natural gas. Eversource, National Grid, Unitil, Liberty Utilities, Columbia Gas, Blackstone Gas, Berkshire Gas, and the Cape Light Compact have developed and implemented ratepayer-funded gas and electric efficiency programs in three-year increments since 2010. The programs are administered as “Mass Save,” and energy-saving improvements that meet eligibility criteria are partially funded by a small portion of every dollar paid on gas and electricity bills. The three-year program plans are reviewed by a stakeholder advisory board, which makes recommendations to state regulators, who in turn review and approve the programs. The process of developing the programs that will be in place for 2019-2021 is currently under way. As the programs approach their tenth year, now is the time to address disparities in who benefits from the programs, and to ask the question of how the programs are doing in reaching traditionally under-served communities and harder-to-reach families. The Commonwealth’s award-winning programs are not reaching many of the Bay Staters who stand to benefit most from the energy and financial savings that come with increased efficiency. Since 2008, the Green Justice Coalition and allied organizations have noted that some residents—including renters, low-to-moderate-income households, and people with limited English-proficiency—are either not reached at all by Mass Save programs, or are not adequately served when they do participate in the programs. For as long as these programs have been in place, GJC has challenged the utilities and policy-makers to quantify and address this disparity and is doing so again during the current three-year planning process. New analysis shows that program improvements are necessary to reach all customers. Despite notable improvements in the programs themselves, and in outreach efforts, thanks in part due to the work of GJC members and allied groups, participation in efficiency programs that serve low-to-moderate income communities has remained very low. The recent study found that the efficiency programs successfully reduced energy consumption statewide between 2013 and 2015, but demographic analysis found that communities with the lowest participation in Mass Save have, on average, proportionally higher percentages of renters, low- and moderate-income people, and households with English as a second language. Even in Boston, a community that enjoys high savings, significant disparities exist between neighborhoods. 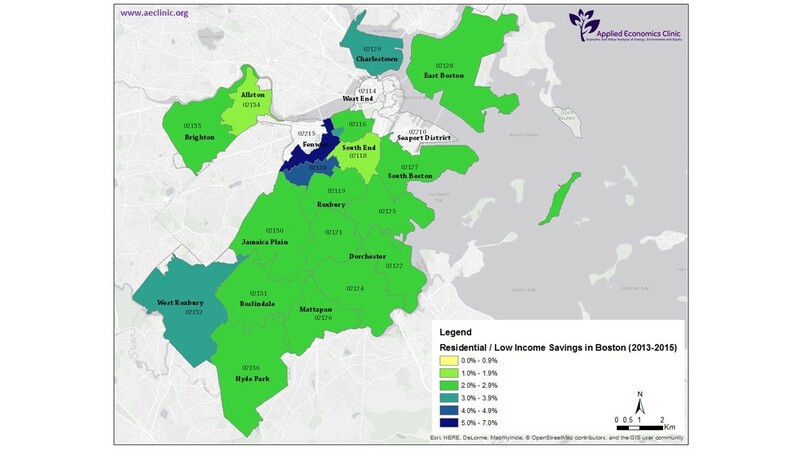 For example, statewide program energy savings is 2.7%, but for residents in Boston neighborhoods savings range from 1.7% in Allston, to 2.5% in East Boston, to 3.1% in West Roxbury. This suggests that even within a high-performing city, where you live matters when it comes to saving energy and saving money. We believe that it shouldn’t. In addition, the new analysis shows that the publicly available data about who is served by our ratepayer-funded programs is incomplete. In order to fully evaluate the programs’ reach and effectiveness, the report points out that access to more complete data is needed. As a result, we will continue to push the state and the utilities to release more data to help us understand these issues, and ensure more equitable delivery of the programs. Even in Boston, a community where high savings have been achieved, significant disparity exists between neighborhoods. AEC’s analysis not only supports the need for program improvements long championed by GJC and its allies, but the maps in the report also provide a clear picture of where there are more energy savings to obtain. At a minimum, the 2019-2021 efficiency plan must address the data and demographic service gaps identified in the study, including dedicated budgets to address barriers to access and to mitigate disparities among communities. For our part, we will continue to challenge the program administrators and policymakers to develop modern and accessible efficiency programs that benefit everyone equitably while serving as a solid foundation to a clean energy transition. Efficiency is a low-cost, zero-emission, local, job-creating energy source. With three plans and nearly 10 years under our collective belts, it is time to ensure that everyone can benefit from energy efficiency. Let’s keep Massachusetts number one in efficiency – for everyone.